The National Democratic Alliance has called a meeting on Tuesday evening at the residence of former Prime Minister and NDA Chairman, Atal Bihari Vajpayee. The meeting is expected to address burning issues like the controversy on phone-tapping, the Delhi High Court notice to Lok Sabha and Rajya Sabha Secretariats, Election Commission and the Centre on petitions by MPs challenging their expulsion from the House for their alleged involvement in the cash-for-query scam. Senior TDP leader and former Andhra Pradesh Home Minister an erstwhile Congress government today took a bath and ate on the road, in a novel protest against the closure of the entrance to his Banjara Hills residence opposite to Chief Minister Rajasekhara Reddy’s. In a touching gesture, the Prime Minister Manmohan Singh today asked Army authorities to waive formalities to enable a sister of an army martyr to get the pensionary dues of her brother, killed in anti-militancy operations in Jammu and Kashmir. The Central Government employees today threatened to go on an indefinite strike from March 1 to press for the implementation of the order of arbitration panel and the constitution of the sixth pay commission for wage hike. Sanjay Leela Bhansali’s film ‘Black’ dominated the annual Kenstar-Max Stardust awards at a glittering ceremony here tonight. Superstar Amitabh Bachchan won the Star of the Year (male) award for ‘Black’ while the Female Star of the Year honour went to Rani Mukherjee for the same movie. Even as the government has announced the setting up of three new universities and upgradation of 15 as centres of excellence, Vice-Chancellors of Central universities want the government to strengthen existing universities and announce incentives for generating internal resources. The Food Ministry has said it will not be able to meet the full requirement of foodgrains under the Targeted Public Distribution System and other welfare schemes due to lower than buffer norm stocks as in October 2005 and other factors. The Centre has asked the states to draw up action plans to achieve the targets under Bharat Nirman Programme in a time-bound manner. Rural Development Minister Raghuvansh Prasad Singh said here yesterday that the government was committed to building better infrastructure in rural areas. Two youths have been killed and 300 others injured in the “Jallikattu” (taming of bulls), an ancient heroic sporting event of the Tamils during the Pongal festive season, at three places in the district since yesterday. The police said the Jallikattu held at Palamedu and suburban Anaiyur today claimed one life each. Villagers try to hold down a bull during a bull-taming festival in Palamedu village, 500 km southwest of Chennai, on Sunday. The annual bull-taming festival is celebrated as part of Pongal. 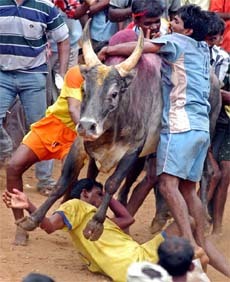 Participants are required to catch a bull and run with it for about 50 metres. The government today announced that a day’s state mourning would be observed tomorrow as a mark of respect to Kuwait’s Emir Sheikh Jaber al-Ahmad al-Sabah, who died after a long illness today. Flying enthusiasts enjoy microlight safari. Kolkata gears up for Chinese New Year. Red rain of possibly extraterrestrial origin. Zinda lends wonderful image to John Abraham. The National Democratic Alliance (NDA) has called a meeting on Tuesday evening at the residence of former Prime Minister and NDA Chairman, Atal Bihari Vajpayee. The meeting is expected to address burning issues like the controversy on phone-tapping, the Delhi High Court notice to Lok Sabha and Rajya Sabha Secretariats, Election Commission and the Centre on petitions by MPs challenging their expulsion from the House for their alleged involvement in the cash-for-query scam. Apart from this, the government’s efforts to defreeze accounts of Bofors scam accused Ottavio Quattrocchi, is also likely to be discussed at the meeting. Prominent coalitition partners of the BJP-led NDA, who are expected to attend the meeting are Janata Dal (United), Shiromani Akali Dal (Badal), Trinmaool Congress, Biju Janata Dal, Shetkari Sangathan from Maharashra and Nagaland Peoples Front. The timing of the meeting is significant as it is scheduled three days before the all-party meeting called by Lok Sabha Speaker Somnath Chatterjee to discuss the situation arising out the Delhi High Court order. The Delhi High Court had on January 9 issued notices to the Lok Sabha and Rajya Sabha Secretariats, Election Commission and the Centre on petitions by eight of the 11 MP's who challenged their expulsion in the cash-for-query scam. Mr Mysoora Reddy, who had left the Congress just before the last general elections following differences with Dr Rajasekhara Reddy and joined the TDP, charged that he was harassed by being denied an entrance to his house with the Municipal Corporation closing both the main and the side entrances at the behest of top Congress leaders. He said he was shocked to see the entrance closed on his return to the city from Kadapa today and chose to stay on the road instead of staying in a lodge. He alleged that Dr Rajasekhara Reddy occupied the government land and got it regularised after he became the Chief Minister. He said he had given about 100 ft of his valuable land to the Municipal Corporation of Hyderabad when it took up a programme for widening roads for the ensuing the AICC plenary. He said he also gave permission for the MCH to close the main entrance for the programme, as he was himself planning to construct a commercial complex. He said the Municipal authorities after closing the main entrance to his house, also closed the side entrance as it was on disputed land. A fensing was put up at the side entrance. A board signed by the District Collector said that the land belonged to the government and tresspassers would be prosecuted. Dr Reddy alleged that the state government had done this to him as he had exposed the misdeeds of the Congress. Dr Reddy recently placed before mediapersons a letter purported to have been written by the PCC chief to an industrialist demanding Rs 5 lakh as donation for the ensuing the AICC plenary. Meanwhile, Chief Minister said the TDP leader was making wild allegations only to gain political advantage. Mr Singh made the gesture as a jobless Yashi Choten, sister of the late Sepoy Ngawang Tenzing of 15 Assam Regiment, narrated her financial woes to him during the reception hosted by Army Chief Gen J.J. Singh at Army House on occasion of the Army Day here. Under the rules, unmarried Tenzing’s pensionary and gallantry benefits would have been retained by the army as only his parents, both of whom are no more, would be only entitled to the benefits. The Prime Minister, on the spot, gave instructions to Army authorities whether as a special case a waiver could be made and benefits given to Choten, who has no means of livlehood. President A.P.J. Abdul Kalaam, the supreme commander of the armed forces, also directed the authorities to explore avenues to get a teaching job for wife of late young Major Lalit Kumar of the Mahar Regiment, who also died during anti-terrorism actions in Jammu and Kashmir. Both the soldiers were among the five armed forces personnel, who were awarded the Sena Medal for exceptional gallantry in daring exploits against militants in Jammu and Kashmir. “Since there has been no response from the government for a negotiated settlement in spite of repeated requests, the strike should commence from March 1,” a statement by the National Council for Central Government Employees said. The government had appointed an arbitration panel to settle disputes with employees but was not implementing its awards, the council said. The body also demanded that another arbitration panel be constituted to correct the anomalies arisen in the implementation of the fifth pay commission’s report. The strike would cover Railways, Defence and other civil establishments, the council said. Bhansali won the Dream Director Award for the film which was also declared the hottest movies of the year. Riteish Deshmukh won the best actor in a supporting role award for ‘Kya Kool Hai Hum’, which he dedicated to his father Vilasrao Deshmukh, Chief Minister of Maharashtra. Shefali Shah won best actress in supporting role for ‘Waqt — race against time’. The Superstar of Tomorrow award (male) went to Kunal Khemu for ‘Kalyug’ and the award in the female category went to Vidya Balan for ‘Parineeta’. Special awards were given to Rekha and Dilip Kumar for their Lifetime Achievement. Stardust actor of the Year award went to Akshay Kumar for ‘Garam Masala’. At the end of a two-day conference, these heads of 18 Central universities sought more flexibility in deciding the recruitment of faculty to tide over the crisis posed by unfilled vacancies on various accounts. Calling for the University Grants Commission (UGC) to become “a facilitator” rather than a “monitoring body”, they have recommended the UGC should not reduce budgetary grants based on generation of internal resources. “If we raise funds from internal sources, that much gets deducted from grants that come from the UGC, which does not help our cause,” said Prof. B.B. Bhattacharya, VC, JNU. Seeking more autonomy particularly with regard to academic, administrative and financial matters, the universities have put forth a demand for flexibility in deciding the requirements of participation in orientation courses and refresher courses for promotion of faculty members. “Overheads on science projects should be increased to a minimum of 30 per cent of the total allocated budget of the project,” Professor Bhattacharya said pointing out that research work draws heavily on the funds allocated. Earlier urging universities to think of an out of the box solution, Union Minister for Science and Technology, Mr Kapil Sibal addressing the Vice Chancellors of Central universities said they need to cut their umbilical cord by which they are attached to the Central government. Encouraging universities to become centres of excellence, he drew comparisons between their counterparts in the United States and other developed nations and indicated that it is time to think of financial independence. “Some universities abroad have more money than corporate houses. They have real estate and reap benefits from their investments,” Mr Sibal said at the Third Central Vice Chancellors Conference hosted at Jawaharlal Nehru University on Friday. Having been a teacher before turning lawyer and later politician, Mr Sibal rued the fact that the academic structure in India ‘is safe and secure’ and therefore puts no pressure on the teaching community to reinvigorate itself. The Food Ministry has said it will not be able to meet the full requirement of foodgrains under the Targeted Public Distribution System (TDPS) and other welfare schemes due to lower than buffer norm stocks as in October 2005 and other factors. “Our projections for 2006-07 indicate that even if levels of procurement of wheat and rice remain high, it will be increasingly difficult to meet the full requirements of foodgrains under the TPDS and other welfare schemes with the existing norms,” the Food Ministry said in a press note. The foodgrain stock in the central pool which had peaked to 648 lakh tonnes in June 2002 fell to 151 lakh tonnes in October 2005. The Centre has asked the states to draw up action plans to achieve the targets under Bharat Nirman Programme in a time-bound manner. Rural Development Minister Raghuvansh Prasad Singh said here yesterday that the government was committed to building better infrastructure in rural areas. 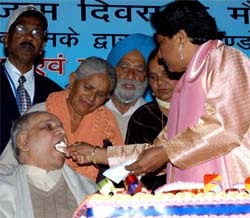 He said development of villages was among top priorities of the UPA Government. The minister said in order to achieve targets, outlived schemes would be redone. He said the Rural Development Ministry had three of six components of Bharat Nirman Programme, including providing road connectivity to villages with population of 1,000 (500 for hilly areas), drinking water to uncovered habitations and constructing 60,000 houses for the poor. The targets were to be achieved in the next four years. The minister stressed the need to remove the disparties between the urban and rural areas. He said for effective implementation of Bharat Nirman programme, strict monitoring would be done. Two youths have been killed and 300 others injured in the “Jallikattu” (taming of bulls), an ancient heroic sporting event of the Tamils during the Pongal festive season, at three places in the district since yesterday. The police said the Jallikattu held at Palamedu and suburban Anaiyur today claimed one life each. Both the victims succumbed to the injuries at the government hospital in the city. They were identified as Sankar (30) of Muduvarpatti, who took part in the sport at Palamedu, and B Periya Ilango of Anaiyur, who participated in the event held in his village. The national flag would fly at half mast and there would be no official ceremonies, an official press note said. The Emir of Kuwait survived an assassination attempt in the 1980s and a decade later, escaped Iraqi troops invading his oil-rich state. The sheikh, who had been ailing since a brain haemorrhage five years back, was 79.